Christina Koukkos shares her must-see-before-I-die list of underwater fauna, with tips on how to get it done. The largest fish in the ocean, a whale shark can grow to 14 meters or more — about the size of a typical Manhattan apartment. 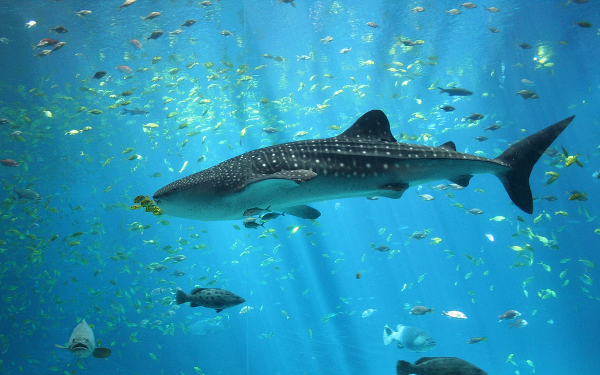 The whale shark population is decreasing, thanks in large part to the shark-fin trade. So far, the whale shark is “only” listed as a vulnerable species. Get there: The Galapagos are 620 miles off the coast of Ecuador. Tourism is strictly but randomly controlled and regulations change frequently. Easiest is to book a live-aboard dive boat, well in advance. Otherwise, take your chances with dive shops on San Cristobal Island, who may or may not be able to get you to Wolf and Darwin Islands. Flights from Quito or Guayaquil to San Cristobal run frequently during high season and cost a few hundred dollars. Try AeroGal, Tame, and LAN Airlines. Book early! Get there: Zanzibar is an island off the coast of Tanzania in southeast Africa. Ferries from Dar es Salaam, the capital, run frequently and take about 1.5 hours. Flights are more expensive, especially with added baggage fees if you bring your own gear. Get there: Dive shops on Koh Phi Phi and Koh Lanta run day trips to Hin Daeng. Richelieu Rock, in the Surin Islands, can only be reached by live-aboards out of Phuket, Khao Lak, or Ranong. AirAsia has cheap flights from Bangkok and Kuala Lumpur to Phuket and Krabi (for ferries to Koh Lanta and Koh Phi Phi), though baggage overage will add to the cost if you bring your own. Get there: During tourist season, buses run from Perth (about 15 hours) and Broome (about 16 hours) in Western Australia. If you’re in a rush, SkyWest does daily two-hour flights from Perth. Get there: Tropic Air and Maya Island Air have flights from Belize City. Flights are often canceled if they aren’t full enough, but this shouldn’t be a problem during tourist season. Get there: The Seychelles, a 115-island nation, sits just north of Madagascar in the Indian Ocean. The cheapest flights are on Emirates and Qatar Airways. Get there: Philippine Airlines flies from the capital of Manila to Legaspi City. From Legaspi to Donsol, either take a cheap private van (aircon, leaves right away), or a ridiculously cheap public van (chickens, open windows, leaves when overstuffed). Great Whites are teeny compared to whale sharks. They only grow to about 6 meters, a mere 3.5 times bigger than I am. But as they are extremely aggressive, the only rational choice for seeing them underwater is from within a cage. Like many sharks, Great Whites are on the list of vulnerable species. Get there: Contact your shark-dive operator to arrange transport to Gansbaai, a two-hour drive from Cape Town. Get there: Port Lincoln is an eight-hour drive from Adelaide, in southeastern Australia. Most divers take a puddle-jumper from Adelaide on Regional Express or Quantas. Get there: Most dive trips leave from San Francisco and the Bay Area. There are nine known species of hammerhead, most of which are either endangered (scalloped and great hammerheads) or vulnerable. The only kind of shark that schools, these relatively shy creatures typically run around 4 meters long. Get there: See info for the whale shark above. Get there: Layang Layang is a small island off the northern coast of Malaysian Borneo. There’s one place to stay, and the only thing to do is dive. A daily charter flies guests in from Kota Kinabalu. AirAsia and Malaysia Airlines have cheap flights from Kuala Lumpur to KK. Get there: These two islands are about 380 miles apart, situated in the Pacific Ocean between Costa Rica and Colombia. Live-aboards originating in Colombia, Panama, and Costa Rica can include stops at one or both. In theory, a day trip to Malpelo can be arranged from Guapi, Colombia, though given the distance (235 miles) I imagine it would be a long, frustrating day. Get there: Most divers fly into Durban. The only direct international flight from outside Africa is on Emirates, from Dubai. Otherwise, Kulula Airlines flies from Johannesburg. Get there: Air Tahiti connects Rangiroa to other parts of the archipelago, including the capital of Papeete on Tahiti island. The mola mola, or ocean sunfish, looks like a 2-meter serving platter with fins. They are shy, deepwater fishes, so it’s extremely rare to see them while diving (as opposed to seeing them from the dive boat in open water). Get there: The international airport on Bali is in Denpasar. AirAsia runs cheap flights from Bangkok, Kuala Lumpur, and other Southeast Asian hubs. Most dive trips to Nusas Penida and Lembogan leave from the coastal town of Sanur, which is a two-hour minivan ride from Denpasar. Get there: See info above for the Galapagos. The largest of all rays at up to 6 meters, mantas are also the most popular. According to my careful observations, one in three dive shops uses a manta in its logo. Buyer beware: “Manta Point” is probably the most misleading dive site name in the world. Get there: See info above for Nusa Penida. Get there: Like Richelieu Rock, Koh Bon can only be reached by live-aboards out of Phuket, Khao Lak, or Ranong. Get there: Micronesia is a federation of 607 islands a few hundred miles east of the Philippines. Continental flies from Guam to Yap at least once a week. Get there: Another archipelago nation, the Maldives are located in the Indian Ocean off the southwest coast of India. The international airport in the capital of Male is served by many operators from Southeast Asia, Dubai, and Europe. The diving improves, naturally, the farther you get from Male. Get there: From San Diego, rent a car and drive down the Baja Peninsula via Tijuana to La Paz. Otherwise, fly to Los Cabos and bus from there. At the other end of the size spectrum, the maximum dimension of a pygmy seahorse is about 2.4cm. They’re seen most often — usually only after your divemaster has found one for you — in the sprawling Indonesian archipelago. They are a vulnerable species. Get there: If you’re not on a live-aboard out of Bali, fly into Sorong. Domestic airlines include Batavia Air, Lion Air, and Garuda Indonesia. Get there: A remote group of islands in the remote Indonesian province of Sulawesi, Wakatobi can be reached by either a live-aboard or a charter flight from Bali. Get there: Regular ferries run between Banda Aceh, the capital of Aceh province, and the island of Pulau Weh. Get there: From Denpasar, rent a car or take a minivan to Amed. At one of the many local dive shops, ask to dive the Liberty Wreck at Tulamben. Get there: AirAsia and Malaysia Airlines do cheap flights from Kuala Lumpur to Tawau, in the province of Sabah. From there, take a shared taxi to Semporna, and then a speedboat to Mabul. All this can be arranged in advance by one of the local dive shops. There are plenty more creatures in Photo Essay: The Matador Photographers’ Animal Kingdom.